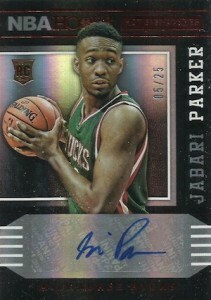 Although it can be overlooked by many collectors because of the low-end focus, 2014-15 Panini Hoops has come out of the gate hot based on several contributing factors. Hobby boxes promise two total autographs, one relic card, several parallels and a variety of inserts. One main reason for the surge of interest for the budget-level product is the fact that it is the first NBA product of the new season. The deep 2014 rookie class had collectors clamoring for rookie cards and autographs for the top draft picks and Hoops is the first product to scratch that itch. The newest group of rookies is headlined by the top two overall picks from the 2014 NBA Draft, Jabari Parker and Andrew Wiggins. 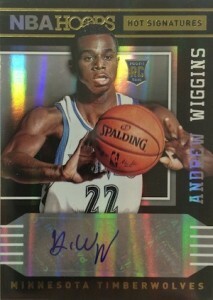 The two players are among several rookies that are Panini exclusives and autographs are available for most of the top picks, including Parker and Wiggins. Collectors are guaranteed one rookie autograph per box. Another reason that Hoops has seen considerable interest is that it has strong collectibility. While hit-centered products and a diminishing focus on base sets are becoming more common, Hoops does not forget the set collectors. In addition to a strong base set featuring 40 rookie cards, a good mix of common and rare inserts add to the appeal and combine to offer a challenging master set. Rookies might be the main draw, but veterans and former greats are also covered with autographs in the product. While all of the signed cards, including rookies, utilize sticker autographs, the design does a solid job of incorporating the sticker. Also, while the interest will be limited more to fans of the team, the reigning champion San Antonio Spurs are covered extensively in several inset sets. Collectors who are tracking the newest crop of rookies or just interested in seeing which cards are commanding the most attention in the product should check out the hot list below. Featuring the 40 most-watched auctions on eBay, the real-time list is constantly updating with the most up-to-date card information.